I was eight when Neil Armstrong walked on the moon and like a lot of folks, I loved the idea of riding a rocket somewhere. It might have been the speed of it all, or maybe the adventure. Whatever the reason, I always wondered what it would be like to be launched into space at more than 17,000 mph. I don’t wonder about that anymore… I now know what it feels like. I’m a rookie at Moda Fabrics and Spring Quilt Market is in three weeks. Okay. That might be a little bit overly dramatic – terra-firma for yours truly – but there are times when it feels like things are hurtling past me at very high speed. Even though I’ve been an exhibitor at Quilt Market more than a dozen times, the logistics of it all are just so much bigger. In short, this ain’t no “booth in a bag” sort of deal. But more on all that in the coming weeks… right now, there is so much to tell you about – lots of alerts and countdowns. Piece & Comfort Challenge. To recognize and honor the sacrifices made by the military families in the U. S., Moda created a fabric collection and a challenge that will benefit USA Cares, an organization that is focused on helping our service men and women, and their families. 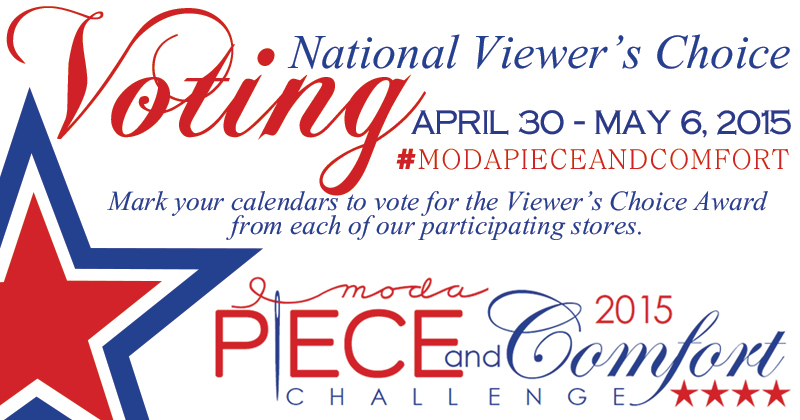 The deadline for participating shops to submit their winning quilt is today and voting opens next Thursday so mark your calendar and stay tuned! UPDATE – The link to the page with pictures of the quilts and the stories behind them will be posted here on The Cutting Table on Thursday, April 30th. Not Pinterest – this is about swapping and collecting pins. 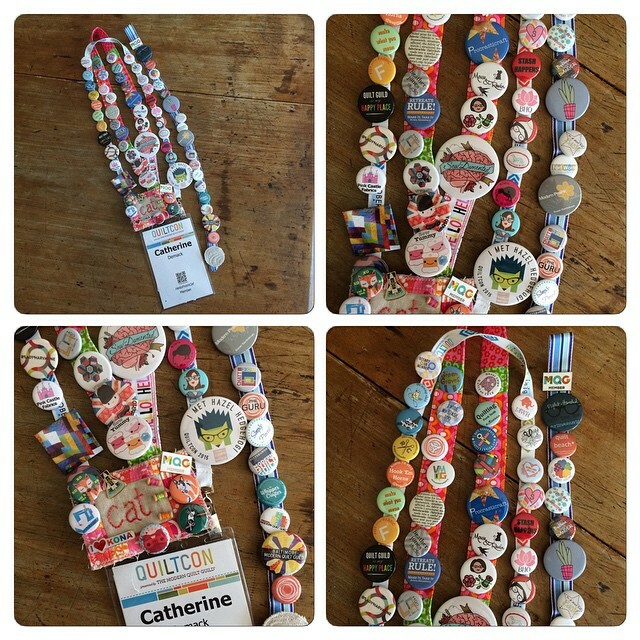 Cool, unique, custom-made pins – the idea is to swap or collect as many pins as you can from other people attending Quilt Market. Yes, she who gets the most pin wins! Seriously! If you had a big collection of these, wouldn’t you feel like you’d won? This was absolutely one of the most infectious and enjoyable things at QuiltCon. Quilters from all over the world designed and made pins in all different sizes, shapes and colors to swap. It wasn’t just the people attending, the vendors and exhibitors were also swapping pins. Half the fun was stopping to actually talk to people, swap pins and take pictures. 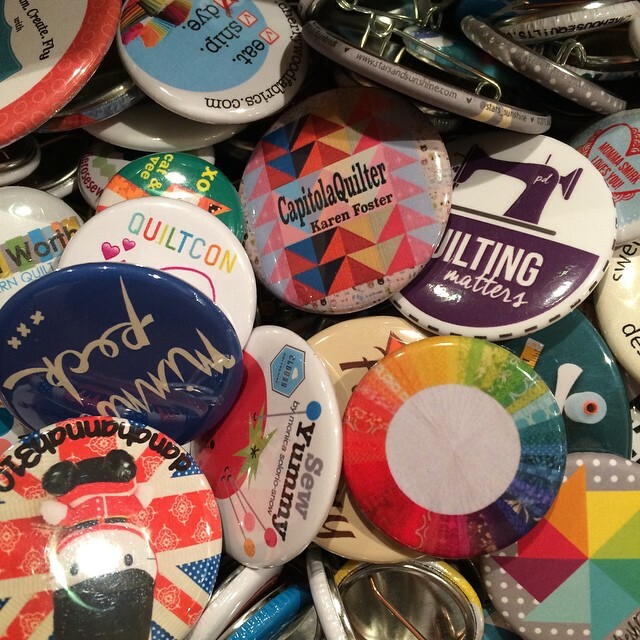 Rumor has it that “many” of the Moda folks will have pins to swap. We’re hoping that people attending – shops, industry folks and other exhibitors – will join in the fun. And maybe – just maybe – someone here might see about collecting extras to share with people who can’t make it to Market. Just saying. Viola is finished and is already at the quilter. I hope you’ll forgive the funky lighting but natural sunlight wasn’t available – I took this at about 1:30 in the morning. The upside was that by staying up late to finish this, I got to see the end of the playoff hockey game that went to three overtime periods. Sewing. I’m locked and loaded and ready for a big sewing weekend. I stopped into Wally-world on my way to work the other morning and stocked up on sizing. There was a young man stocking the shelves and he was standing right in front of the sizing. I apologized for interrupting his work but I needed sizing. He laughed and handed me a can, teasing that now he wasn’t going to have enough cans to keep the rows even. I told him that I could help with that, I really needed every can he had – all ten of them. (At $.97 a can, it’s worth stocking up when I’m there.) He laughed again, said he appreciated my cooperation and could I help him with the rest of the shelves. That’s all I can think of for today… but I do need to warn you that I think there is some mischief afoot. I’m hearing whispers and what can only be described as chortling. And I’m certain I heard someone use the word “coup”. Ahh Market. So many quilty people so close, and yet so far. Please post tons of pics and I’ll wave to y’all from my office building in Minneapolis. Ok, I really need to know about the ten cans of sizing. I assume they’re for making perfect HSTs, something I struggle with often. What’s your secret to “perfection”, pray tell! Hi Teresa – I “prep” my fabrics with spray starch or sizing before cutting. I do it for two reasons – to add a little crispness and to “pre-shrink” the fabrics. The crispness helps me cut and piece more accurately. Some folks like the technique, others don’t; it’s one of those “this works for me” sort of things. The pre-shrinking is also a huge factor for me because I like to press with steam – a lot of it. When I’m working with charm squares, mini charms and layer cakes, pre-washing really isn’t an option so prepping my fabrics with starch/sizing usually eliminates the problem of the fabrics shrinking when they get pressed with steam. Thanks! I bet I read that earlier post and the info fell out of my head when I slept. Seems to happen more and more often lately! Carrie, I also love you posts. Love your writing style; your sense of humor. I haven’t tried the spray sizing thing yet, but may have to now. 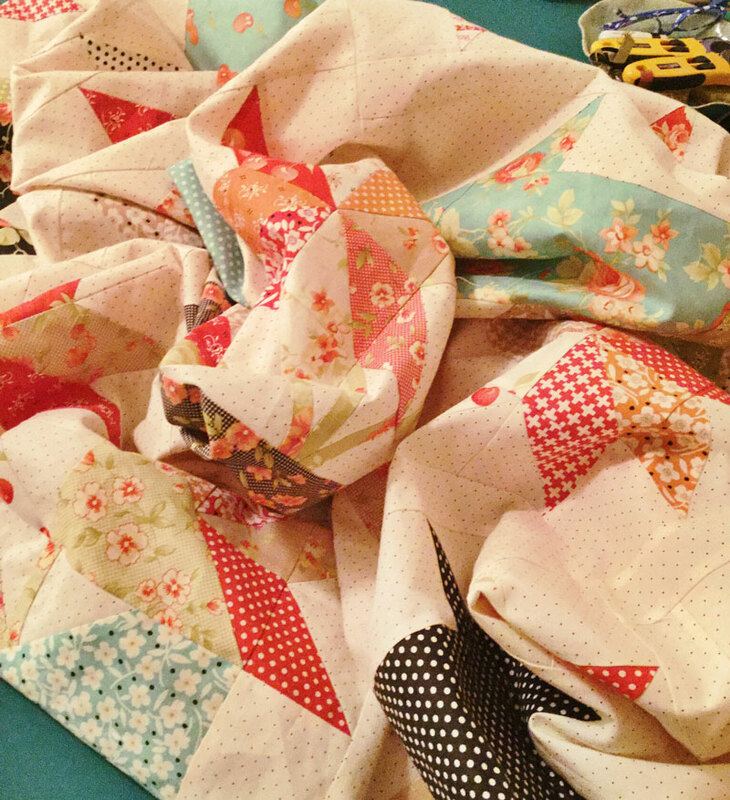 One question: what is the name of the background fabric you used for the Viola quilt you have pictured? Off white with some tiny dots. I like using backgrounds with a little print but they seem to be hard for me to find. Love this one. Enjoy Market! Well I do hope that you did not make it to the Wally world in my neck of the woods since I will be needing to make a trip there myself and probably need more sizing. I actually use Starch even though you mentioned before it may attract bugs. Not a problem, once my quilts are bound I usually throw them in the washer anyway, I too hope you post lots of pictures from Market for those poor souls that must stay behind and work. One of these days I will retire and try to sneak in. LOL. Don’;t tell anyone! Have a good weekend sewing , I plan on doing the same. But I sure could use some of those great custom made pins..
Just wanted to comment that I love your posts (best of all…. shhhhh….. don’t tell). Always interesting and yes, they make me chortle too. 🙂 I think you’ll have a ball at spring market. We are all getting excited since you’re taking us along to market! I was jealous of all the cute pin trading at Quilt Con and will be paying attention to what you’ve got going on for us, thanks Carrie. I just realized that you are a pattern-tease. Seriously. I drooled over Viola in your last sneak preview, and now, there she is – revealing just enough to get my saliva flowing again – but still no timeframe on WHEN AND WHERE AND HOW SHE WILL BE AVAILABLE!!!!!!!! I am guessing there are many, many of us who reeeeeeeeaaaaaaaalllllllllllllllyyyyyyyyyyyy….want to know!!!! :o) Happy sewing weekend! Chortling … I love that word! And I love the name of your quilt, Viola, and the quilt, too. But especially the name! There’s a story that I won’t bore you with, but Penny was almost named Viola! Of course, she might have hated me for that! I suspect with all those wacky Moda folks around there’s probably a coup du jour! I know you guys all work really hard but what fun you have! Be sure to pack your phone charger because we want lots and lots of pictures! Love your blog. I too have vivid memorys of the moon landing at aged 8. WHere do we see the quilts and how do we vote? Glad I’m not the only one that buys in bulk. 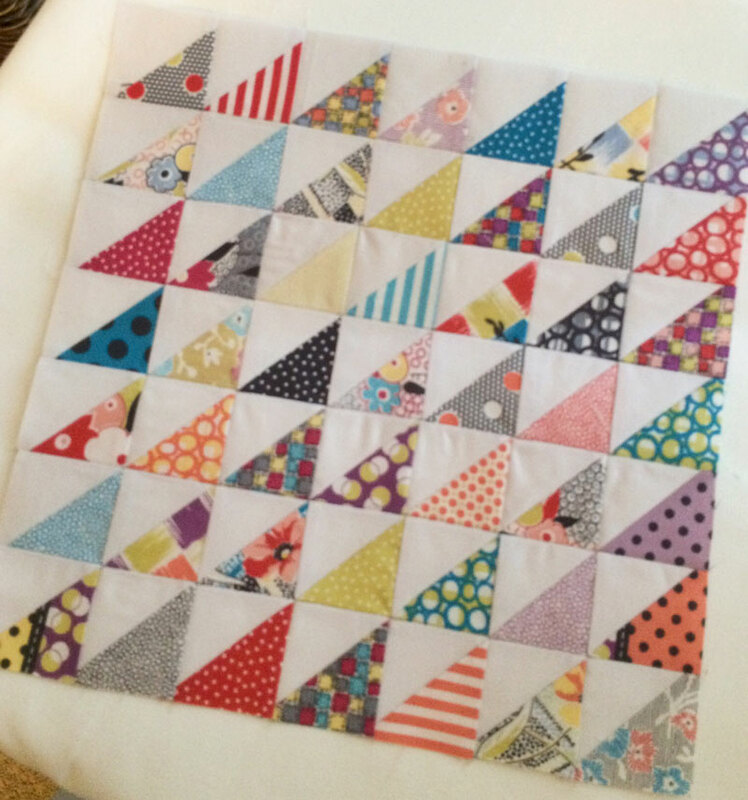 I love that mini half square triangle block, great way to use up the scraps and will make a stunning quilt! Is there a reason your are not allowing the Honey Bee quilt to be voted on? And why did you delete my comment earlier comment?